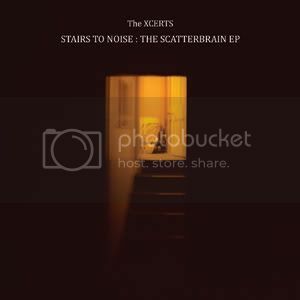 ‘Stairs To Noise: The Scatterbrain EP’ is a great entry point if you are new to Aberdeen’s The Xcerts. Over its five tracks, the band are able to encapsulate every facet of their sound, from driving, sweaty power pop, to emo-edged ballads, to the out-right epic. ‘Scatterbrain’ bursts into life through a wall of noise, with Tom Heron‘s drums powering the band into the chorus. It’s all very reminiscent of ‘Vices’ by Brand New, the opening track from their album ‘Daisy’, which is no bad thing, although it is a little jarring once you make the connection. This comparison is soon forgotten though, as those drums build again to a fantastic crescendo. It’s fast and it’s exciting. This momentum is quickly lost as ‘Tear Me Down’ begins. Out comes The Xcerts‘ darker side, with their distinctive, ethereal guitar sound and truly spine tingling chorus. Like a whisper in a graveyard, Murray Macleod‘s vocals bristle with both vulnerability and angst as the rest of the band noodle their way through to a gripping bridge. This is the highlight of the song, and quite possibly the whole EP, with Jordan Smith and Tom providing Adam Lazzara-esque backing screams, making the section feel like some lost Taking Back Sunday session from the ‘Louder Now’ years, before dropping away in to silence. Next up is ‘Say Yes’, which feels like somewhat of an oddity. A cover of Elliot Smith’s understated love song, The Xcerts don’t play around too much with original, choosing rather to let Smith‘s excellent song writing stand by itself. It’s a thoroughly enjoyable 2 minutes none the less, but it is a shame that the trio decided not to put their unique stamp on it. Just as you’re coming back up with that lovely track, ‘Let’s Run’ arrives with some more pristine-polished melancholy to bring you softly back down again. Murray strays a little too close to emo melodrama on the verses, “I was outside when I first heard you singing the blues / Your sadness sounded beautiful” is perhaps the most offensive line, and is delivered airing much closer on the side of a whine than the band normally choose. But then the first chorus hits (oh the chorus! ), and all is forgiven. With rousing chants and driving drums, as well as an explosive ride hurtling to the ending, this is one of the band’s strongest songs on any of their records, and will no doubt soon become a live favourite. Rounding this promising EP off is ‘Mannequin Champion’ which, to any fan of the band who bought ‘Scatterbrain’, will sound very familiar. A re-working of ‘Slackerpop’, track 5 from the album, ‘Mannequin Champion’ is a much heartier, slower, epic affair, with sprawling strings and a slower tempo. This version feels denser and more powerful than its whippet-quick punky counterpart, and will surely cause a division in the fan base as to which version is superior. ‘Stairs To The Noise’ is a very strong offering from the Scottish 3-piece, but it does pose a problem for the fans who’ve already bought full-length ‘Scatterbrain’. Effectively there isn’t much new music here (‘Scatterbrain’ appeared on the album, ‘Say Yes’ is a cover and ‘Mannequin Champion’ is a re-imagining), so understandably some may feel let down by the slim pickings. However, if you are new to them, then there’s no better way to get acquainted with The Xcerts‘ music. Pick this one up. NEWS: Bowling For Soup reveal artwork and tracklisting for ‘Fishin’ For Woos’! NEWS: Hit The Deck Fesitval confirms more bands for 2014, including Kvelertak and Pulled Apart By Horses!